When a person sins God can forgive them next through Jesus Christ, but there often is still negative earthly consequences for them especially related as to how long it took them to repent, as we see examples of this in both the Old and New Testament. Even in the New Testament era, today God is not mocked what a person sows he reaps, a Jew or not too. 1 Corinthians 10: 21 Ye cannot drink the cup of the Lord, and the cup of devils: ye cannot be partakers of the Lord’s table, and of the table of devils. 1 Corinthians 11:27 Wherefore whosoever shall eat this bread, and drink this cup of the Lord, unworthily, shall be guilty of the body and blood of the Lord. Numbers 1421 But as truly as I live, all the earth shall be filled with the glory of the LORD. 22 Because all those men which have seen my glory, and my miracles, which I did in Egypt and in the wilderness, and have tempted me now these ten times, and have not hearkened to my voice; 23 Surely they shall not see the land which I sware unto their fathers, neither shall any of them that provoked me see it: 24 But my servant Caleb, because he had another spirit with him, and hath followed me fully, him will I bring into the land where into he went; and his seed shall possess it. 25 (Now the Amalekites and the Canaanites dwelt in the valley.) To morrow turn you, and get you into the wilderness by the way of the Red sea. The Holy Scriptures States that if we are obedient, then we shall receive goodness from the Lord, but OUR DISOBEDIENCE TO GOD will still lead to consequence and adversity as it’s a terrible thing to disobey the God; there have been plenty of persons mentioned in the Bible who thought they were a lot smarter than God, who chose to do things their way over God’s ways so they next faced severe negative consequences over it also. Jesus Hebrews 7:27 Who needeth not daily, as those high priests, to offer up sacrifice, first for his own sins, and then for the people’s: for this he did once, when he offered up himself. 1 Timothy 5: 20 Them that sin rebuke before all, that others also may fear. There is your continual free will choice to be made: either you are a slave to sin or you are a slave of righteousness. There is no middle ground. You serve God or you serve the devil. THIIS POST HERE IS THE SECOND MOT POPLUAR POSTS OF MINE. The primary source for the history of ancient Jerusalem and Israel is, of course, the Bible. The Old and New Testament is a chronicle of Israel’s repeated failure to obey God, of their refusal to keep His commandments and statutes and for sure not something for Jews to boast about. 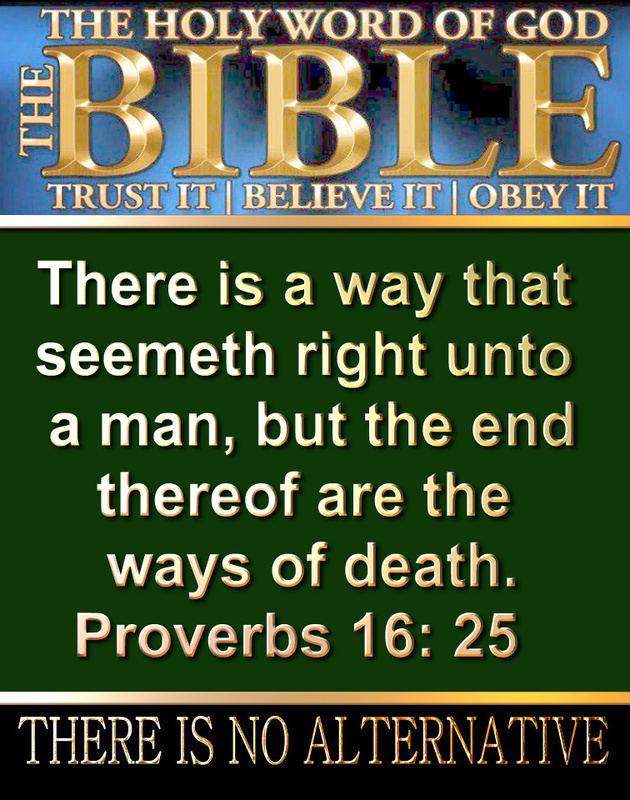 Proverbs 16: 25 There is a way that seemeth right unto a man, but the end thereof are the ways of death. -Cain, who murders his own brother, Abel. Cain was the first-born son of Adam and Eve, making him the first human child to be born in the Bible. Like his father Adam, he became a farmer and worked the soil. This Bible account of Cain and Abel begins with the two brothers bringing an offering to the Lord. God as usual had instructed them to sacrifice a first born lamb, a symbol of his son, the Messiah, Jesus Christ. God was pleased with Abel’s sacrifice, but not with Cain’s because Cain rather did it his own way, he disobeyed God. Cain, willfully, would not heed God’s instruction As a result Cain next even falsely grew angry, dejected and jealous. Soon his fierce anger led him to commit the murder of Abel. Genesis 4:6.7 Then the LORD said to Cain, “Why are you angry? Why is your face downcast? If you do what is right, will you not be accepted? But if you do not do what is right, sin is crouching at your door; it desires to have you, but you must master it. Hebrews 11:4 By faith Abel offered unto God a more excellent sacrifice than Cain, by which he obtained witness that he was righteous, God testifying of his gifts: and by it he being dead yet speaketh. 1 John 3” 12 Not as Cain, who was of that wicked one, and slew his brother. And wherefore slew he him? Because his own works were evil, and his brother’s righteous. Jude 1:11 Woe unto them! for they have gone in the way of Cain, and ran greedily after the error of Balaam for reward, and perished in the gainsaying of Core. -Jonah was a prophet of God but once God told him to go to the Ninevites and tell them to repent, Jonah disobeyed because he was afraid and because he didn’t think they deserved to be forgiven. Jonah 1 :1 Now the word of the LORD came unto Jonah the son of Amittai, saying, 2 Arise, go to Nineveh, that great city, and cry against it; for their wickedness is come up before me. 3 But Jonah rose up to flee unto Tarshish from the presence of the LORD, and went down to Joppa; and he found a ship going to Tarshish: so he paid the fare thereof, and went down into it, to go with them unto Tarshish from the presence of the LORD. 4 But the LORD sent out a great wind into the sea, and there was a mighty tempest in the sea, so that the ship was like to be broken. 5 Then the mariners were afraid, and cried every man unto his god, and cast forth the wares that were in the ship into the sea, to lighten it of them. But Jonah was gone down into the sides of the ship; and he lay, and was fast asleep. 6 So the shipmaster came to him, and said unto him, What meanest thou, O sleeper? arise, call upon thy God, if so be that God will think upon us, that we perish not. 7 And they said every one to his fellow, Come, and let us cast lots, that we may know for whose cause this evil is upon us. So they cast lots, and the lot fell upon Jonah. 8 Then said they unto him, Tell us, we pray thee, for whose cause this evil is upon us; What is thine occupation? and whence comest thou? what is thy country? and of what people art thou? 9 And he said unto them, I am an Hebrew; and I fear the LORD, the God of heaven, which hath made the sea and the dry land. 10 Then were the men exceedingly afraid, and said unto him, Why hast thou done this? For the men knew that he fled from the presence of the LORD, because he had told them. 11 Then said they unto him, What shall we do unto thee, that the sea may be calm unto us? for the sea wrought, and was tempestuous.12 And he said unto them, Take me up, and cast me forth into the sea; so shall the sea be calm unto you: for I know that for my sake this great tempest is upon you.13 Nevertheless the men rowed hard to bring it to the land; but they could not: for the sea wrought, and was tempestuous against them. 14 Wherefore they cried unto the LORD, and said, We beseech thee, O LORD, we beseech thee, let us not perish for this man’s life, and lay not upon us innocent blood: for thou, O LORD, hast done as it pleased thee.15 So they took up Jonah, and cast him forth into the sea: and the sea ceased from her raging.16 Then the men feared the LORD exceedingly, and offered a sacrifice unto the LORD, and made vows. 17 Now the LORD had prepared a great fish to swallow up Jonah. And Jonah was in the belly of the fish three days and three nights. Jonah 2:1 Then Jonah prayed unto the LORD his God out of the fish’s belly,…. 10 And the LORD spake unto the fish, and it vomited out Jonah upon the dry land. –Eli AND HIS SONS . Sam 2:12 Now the sons of Eli were sons of Belial; they knew not the LORD.13 And the priest’s custom with the people was, that, when any man offered sacrifice, the priest’s servant came, while the flesh was in seething, with a fleshhook of three teeth in his hand;14 And he struck it into the pan, or kettle, or caldron, or pot; all that the flesh hook brought up the priest took for himself. So they did in Shiloh unto all the Israelites that came thither.15 Also before they burnt the fat, the priest’s servant came, and said to the man that sacrificed, Give flesh to roast for the priest; for he will not have sodden flesh of thee, but raw.16 And if any man said unto him, Let them not fail to burn the fat presently, and then take as much as thy soul desireth; then he would answer him, Nay; but thou shalt give it me now: and if not, I will take it by force.17 Wherefore the sin of the young men was very great before the LORD: for men abhorred the offering of the LORD. … 22 Now Eli was very old, and heard all that his sons did unto all Israel; and how they lay with the women that assembled at the door of the tabernacle of the congregation.23 And he said unto them, Why do ye such things? for I hear of your evil dealings by all this people.24 Nay, my sons; for it is no good report that I hear: ye make the LORD’S people to transgress.25 If one man sin against another, the judge shall judge him: but if a man sin against the LORD, who shall intreat for him? Notwithstanding they hearkened not unto the voice of their father, because the LORD would slay them.26 And the child Samuel grew on, and was in favour both with the LORD, and also with men.27 And there came a man of God unto Eli, and said unto him, Thus saith the LORD, Did I plainly appear unto the house of thy father, when they were in Egypt in Pharaoh’s house?28 And did I choose him out of all the tribes of Israel to be my priest, to offer upon mine altar, to burn incense, to wear an ephod before me? and did I give unto the house of thy father all the offerings made by fire of the children of Israel?29 Wherefore kick ye at my sacrifice and at mine offering, which I have commanded in my habitation; and honourest thy sons above me, to make yourselves fat with the chiefest of all the offerings of Israel my people?30 Wherefore the LORD God of Israel saith, I said indeed that thy house, and the house of thy father, should walk before me for ever: but now the LORD saith, Be it far from me; for them that honour me I will honour, and they that despise me shall be lightly esteemed.31 Behold, the days come, that I will cut off thine arm, and the arm of thy father’s house, that there shall not be an old man in thine house.32 And thou shalt see an enemy in my habitation, in all the wealth which God shall give Israel: and there shall not be an old man in thine house for ever.33 And the man of thine, whom I shall not cut off from mine altar, shall be to consume thine eyes, and to grieve thine heart: and all the increase of thine house shall die in the flower of their age.34 And this shall be a sign unto thee, that shall come upon thy two sons, on Hophni and Phinehas; in one day they shall die both of them.35 And I will raise me up a faithful priest, that shall do according to that which is in mine heart and in my mind: and I will build him a sure house; and he shall walk before mine anointed for ever.36 And it shall come to pass, that every one that is left in thine house shall come and crouch to him for a piece of silver and a morsel of bread, and shall say, Put me, I pray thee, into one of the priests’ offices, that I may eat a piece of bread. -King Saul disobeyed God TOO MANYTIMES. 1 Samuel 15:22 And Samuel said, Hath the LORD as great delight in burnt offerings and sacrifices, as in obeying the voice of the LORD? Behold, to obey is better than sacrifice, and to hearken than the fat of rams. AND 1 Samuel 28:15 And Samuel said to Saul, Why hast thou disquieted me, to bring me up? And Saul answered, I am sore distressed; for the Philistines make war against me, and God is departed from me, and answereth me no more, neither by prophets, nor by dreams: therefore I have called thee, that thou mayest make known unto me what I shall do.16 Then said Samuel, Wherefore then dost thou ask of me, seeing the LORD is departed from thee, and is become thine enemy?17 And the LORD hath done to him, as he spake by me: for the LORD hath rent the kingdom out of thine hand, and given it to thy neighbour, even to David:18 Because thou obeyedst not the voice of the LORD, nor executedst his fierce wrath upon Amalek, therefore hath the LORD done this thing unto thee this day.19 Moreover the LORD will also deliver Israel with thee into the hand of the Philistines: and to morrow shalt thou and thy sons be with me: the LORD also shall deliver the host of Israel into the hand of the Philistines.20 Then Saul fell straightway all along on the earth, and was sore afraid, because of the words of Samuel: and there was no strength in him; for he had eaten no bread all the day, nor all the night. Saul disobeyed God in a battle with the Amalekites, sparing the enemy’s king and the best of their livestock, when Samuel had ordered Saul to destroy everything. God was so grieved that he rejected Saul and chose another king. Samuel went to Bethlehem and anointed the young shepherd David, son of Jesse. Thus began a years-long ordeal as the jealous Saul chased David through the hills, trying to kill him. King Saul destroyed the Amalekites like God asked him to do but he also FALSELY HAD spared King Agag, who was disobedient to God. We as Christians should fully obey God and no one else, nor should we do what we think is right without God’s wisdom, instruction. .Isaiah 30:21 And thine ears shall hear a word behind thee, saying, This is the way, walk ye in it, when ye turn to the right hand, and when ye turn to the left. Samuel made yet another appearance to Saul–after Samuel had died! Saul sinfully visited a medium, the witch of Endor, ordering her to bring up the spirit of Samuel, on the eve of a great battle. In 1 Samuel 28:16-19, that apparition told Saul he would lose the battle, along with his life and the lives of his two sons. ; Then later on in life, Saul had so much pride that he praised himself for the victory over the Amalekites. Unfortunately for Saul, he was stripped from his king rights. Saul admits later on in his life that he sinned and how he feared people and not God. However, it should beeen the opposite. He should have feared God and obeyed him a 100%. In his farewell speech, the aged Samuel warned the people to give up idols and serve the true God. He told them if they and King Saul disobeyed, God would sweep them away. And Saul did disobey, offering a sacrifice himself instead of waiting for God’s priest, Samuel, to do it. -KING DAVID WHO WRONGFULLY NUMBERED THE PEOPLE – SATAN stood up against Israel, and provoked David to number Israel.” (1Chronicles 21:1, KJV]. With his cunning ways the devil set out to entice David to sin by numbering his army – which David did! SATAN that moved David to disobey God. David seems to have been prompted by a feeling of pride and ambitious curiosity. Because king David he did this to determine HIS power and to trust in it, it offended God. 2 Samuel 24:10 ” 10 But after he had taken the census, David’s conscience began to bother him. And he said to the Lord, “I have sinned greatly by taking this census. Please forgive my guilt, Lord, for doing this foolish thing.” As a punishment for this sin God brought three days of pestilence that killed 70,000 Israelites. (2 Sam. 24:12-16) But the lesson taught here is clear that the : governments that calculate their military might for vain purposes do indeed bring much suffering upon their people. -AARON The people said to Aaron, “Make us gods that shall go before us; but for this Moses, who brought us up out of the land of Egypt, we do not know what has become of him!” (Exodus 32:1). And what was Aaron’s response to this ill-conceived, ungodly request on the part of his Israelite brethren? Now what Aaron should have said was this: “No, I will not do this!—because God Himself commanded us not to do so, ‘God has said to the Israelites that ”You shall have no other gods before Me. You shall not make for yourself a carved image, or any likeness of anything that is in heaven above, or that is in the earth beneath, or that is in the water under the earth, and you shall not bow down to them nor serve them” (Exodus 20:3-4). Yet here is what Aaron actually wrongfully did say: “Break off the golden earrings which are in the ears of your wives, your sons, and your daughters, and bring them to me” (Exodus 32:2). The Israelites did as Aaron commanded. And, as Exodus 32:4 goes on to tell us, “Aaron received the gold from their hands, and he fashioned it with an engraving tool, and made a molded calf. Then the people said, ‘This is your god, O Israel, which brought you out of the land of Egypt!’ ” What happened next was sad. Exodus 32:6 says that the Israelites “rose early on the next day, offered burnt offerings and brought peace offerings [to the golden calf]; and the people sat down to eat and drink, and rose up to play.” Less than a month and a half now after the entire Israelite nation had heard the thundering voice of God scream from Mount Sinai, “You shall have no other gods before Me!,” those very same Israelites begged for an idol to worship as “another god.” And sadly even Aaron gave in to their wicked, fleshly desires. Moses came down from the top of Mount Sinai where he had met with God. Exodus 32:19,25 tells us: “As Moses came near the camp, he saw the calf and the dancing…. And Moses saw that the people were naked, for Aaron had not restrained them.” The people not only were worshiping a pagan idol as their god, but also were engaging in gross sexual immorality that had affected now the entire nation! Exodus 32:19-20 records Moses’ reaction: “Moses’ anger became hot, and he cast the tablets out of his hands and broke them at the foot of the mountain. Then he took the calf that the people had made, burned it in the fire, ground it to powder, scattered it on the water, and made the children of Israel drink it.” Moses then said to the Levites, “Let every man put his sword on his side, and go in and out from entrance to entrance throughout the camp, and let every man kill his brother, every man his companion, and every man his neighbor” (Exodus 32:27). As Exodus 32:28 goes on to tell us, “About three thousand men of the people fell that day.” But that is not all that happened. Exodus 32:35 goes on to add, “So the Lord plagued the people because of what they did with the calf which Aaron made.” And what was Aaron’s response when Moses turned asked him, “What did the people do to you that caused you to bring so great a sin upon them?” (Exodus 32:21). But Aaron’s pitiful, shamefaced response was, “The people gave me their gold, and I cast it into the fire, and this calf came out” (Exodus 32:23-24)—as if Moses (or anyone else) would ever believe such a ridiculous excuse! NUMBERS 10:1 And Nadab and Abihu, the sons of Aaron, took either of them his censer, and put fire therein, and put incense thereon, and offered strange fire before the LORD, which he commanded them not. 2 And there went out fire from the LORD, and devoured them, and they died before the LORD. 3Then Moses said to Aaron, This is it that the LORD spoke, saying, I will be sanctified in them that come near me, and before all the people I will be glorified. And Aaron held his peace. NUMBERS 12:1 And Miriam and Aaron spake against Moses because of the Ethiopian woman whom he had married: for he had married an Ethiopian woman.2 And they said, Hath the LORD indeed spoken only by Moses? hath he not spoken also by us? And the LORD heard it. 3 (Now the man Moses was very meek, above all the men which were upon the face of the earth. )4 And the LORD spake suddenly unto Moses, and unto Aaron, and unto Miriam, Come out ye three unto the tabernacle of the congregation. And they three came out.5 And the LORD came down in the pillar of the cloud, and stood in the door of the tabernacle, and called Aaron and Miriam: and they both came forth.6 And he said, Hear now my words: If there be a prophet among you, I the LORD will make myself known unto him in a vision, and will speak unto him in a dream.7 My servant Moses is not so, who is faithful in all mine house.8 With him will I speak mouth to mouth, even apparently, and not in dark speeches; and the similitude of the LORD shall he behold: wherefore then were ye not afraid to speak against my servant Moses?9 And the anger of the LORD was kindled against them; and he departed.10 And the cloud departed from off the tabernacle; and, behold, Miriam became leprous, white as snow: and Aaron looked upon Miriam, and, behold, she was leprous.11 And Aaron said unto Moses, Alas, my lord, I beseech thee, lay not the sin upon us, wherein we have done foolishly, and wherein we have sinned.12 Let her not be as one dead, of whom the flesh is half consumed when he cometh out of his mother’s womb.13 And Moses cried unto the LORD, saying, Heal her now, O God, I beseech thee.14 And the LORD said unto Moses, If her father had but spit in her face, should she not be ashamed seven days? let her be shut out from the camp seven days, and after that let her be received in again. 15 And Miriam was shut out from the camp seven days: and the people journeyed not till Miriam was brought in again. -MOSES NUMBERS 20:20 In the first month all the people of Israel arrived at the Desert of Zin, and they stayed at Kadesh. There Miriam died and was buried. 2 There was no water for the people, so they came together against Moses and Aaron. 3 They argued with Moses and said, “We should have died in front of the Lord as our brothers did. 4 Why did you bring the Lord’s people into this desert? Are we and our animals to die here? 5 Why did you bring us from Egypt to this terrible place? It has no grain, figs, grapevines, or pomegranates, and there’s no water to drink!”6 So Moses and Aaron left the people and went to the entrance of the Meeting Tent. There they bowed facedown, and the glory of the Lord appeared to them. 7 The Lord said to Moses, 8 “Take your walking stick, and you and your brother Aaron should gather the people. Speak to that rock in front of them so that its water will flow from it. When you bring the water out from that rock, give it to the people and their animals.”9 So Moses took the stick from in front of the Lord, as he had said. 10 Moses and Aaron gathered the people in front of the rock, and Moses said, “Now listen to me, you who turn against God! Do you want us to bring water out of this rock?” 11 Then Moses lifted his hand and hit the rock twice with his stick. Water began pouring out, and the people and their animals drank it. 12 But the Lord said to Moses and Aaron, “Because you did not believe me, and because you did not honor me as holy before the people, you will not lead them into the land I will give them.”13 These are the waters of Meribah,[a] where the Israelites argued with the Lord and where he showed them he was holy. Psalms 106:7 Our fathers understood not thy wonders in Egypt; they remembered not the multitude of thy mercies; but provoked him at the sea, even at the Red sea.8 Nevertheless he saved them for his name’s sake, that he might make his mighty power to be known.9 He rebuked the Red sea also, and it was dried up: so he led them through the depths, as through the wilderness.10 And he saved them from the hand of him that hated them, and redeemed them from the hand of the enemy.11 And the waters covered their enemies: there was not one of them left.12 Then believed they his words; they sang his praise.13 They soon forgat his works; they waited not for his counsel:14 But lusted exceedingly in the wilderness, and tempted God in the desert.15 And he gave them their request; but sent leanness into their soul.16 They envied Moses also in the camp, and Aaron the saint of the LORD.17 The earth opened and swallowed up Dathan, and covered the company of Abiram.18 And a fire was kindled in their company; the flame burned up the wicked.19 They made a calf in Horeb, and worshipped the molten image.20 Thus they changed their glory into the similitude of an ox that eateth grass.21 They forgat God their saviour, which had done great things in Egypt;22 Wondrous works in the land of Ham, and terrible things by the Red sea.23 Therefore he said that he would destroy them, had not Moses his chosen stood before him in the breach, to turn away his wrath, lest he should destroy them.24 Yea, they despised the pleasant land, they believed not his word:25 But murmured in their tents, and hearkened not unto the voice of the LORD.26 Therefore he lifted up his hand against them, to overthrow them in the wilderness:27 To overthrow their seed also among the nations, and to scatter them in the lands.28 They joined themselves also unto Baal-peor, and ate the sacrifices of the dead.29 Thus they provoked him to anger with their inventions: and the plague brake in upon them.30 Then stood up Phinehas, and executed judgment: and so the plague was stayed.31 And that was counted unto him for righteousness unto all generations for evermore.32 They angered him also at the waters of strife, so that it went ill with Moses for their sakes:33 Because they provoked his spirit, so that he spake unadvisedly with his lips.34 They did not destroy the nations, concerning whom the LORD commanded them:35 But were mingled among the heathen, and learned their works.36 And they served their idols: which were a snare unto them.37 Yea, they sacrificed their sons and their daughters unto devils,38 And shed innocent blood, even the blood of their sons and of their daughters, whom they sacrificed unto the idols of Canaan: and the land was polluted with blood.39 Thus were they defiled with their own works, and went a whoring with their own inventions.40 Therefore was the wrath of the LORD kindled against his people, insomuch that he abhorred his own inheritance.41 And he gave them into the hand of the heathen; and they that hated them ruled over them.42 Their enemies also oppressed them, and they were brought into subjection under their hand.43 Many times did he deliver them; but they provoked him with their counsel, and were brought low for their iniquity.44 Nevertheless he regarded their affliction, when he heard their cry:45 And he remembered for them his covenant, and repented according to the multitude of his mercies.46 He made them also to be pitied of all those that carried them captives.47 Save us, O LORD our God, and gather us from among the heathen, to give thanks unto thy holy name, and to triumph in thy praise.48 Blessed be the Lord God of Israel from everlasting to everlasting: and let all the people say, Amen. Praise ye the LORD. Psalms 106:32-33 states that the people angered Moses at the waters of strife, that it went ill with Moses, and that he sinned with his mouth. The incident in question occurred in Numbers 20:7-13. . The very next verse states that the people were complaining about the lack of water. This had happened many times during their wilderness experience. And like the other times, the people railed against Moses and Aaron, whining that they would have been better off if they had stayed in Egypt. Moses and Aaron responded by falling face down. God responded quickly, telling Moses to speak to the rock in front of all the people. Water would come gushing out — enough water for everyone. Moses assembled the people, but he didn’t follow orders quite the way he should have. Instead of just speaking to the rock, which would have demonstrated the power of the word over the power of his rod, he struck it twice, saying, “Listen, you rebels, shall we get water for you out of this rock?” MOSES called them rebels, which in a sense they were. But God did not tell him to do this. Nor was there any mention of God at that point. All seemed directed at Moses and Aaron: “Must we bring water out of this rock?” The bottom line is that both he and Aaron disobeyed God. Moreover, the water that rushed out was no longer seen as a gift from God, but was a product of Moses and Aaron. The people were happy; God was not. – SOLOMON How did Solomon disobey God? He married foreign women, who then led him to worship idols. ; 1 Kings 11:1 But king Solomon loved many strange women, together with the daughter of Pharaoh, women of the Moabites, Ammonites, Edomites, Zidonians, and Hittites;2 Of the nations concerning which the LORD said unto the children of Israel, Ye shall not go in to them, neither shall they come in unto you: for surely they will turn away your heart after their gods: Solomon clave unto these in love.3 And he had seven hundred wives, princesses, and three hundred concubines: and his wives turned away his heart.4 For it came to pass, when Solomon was old, that his wives turned away his heart after other gods: and his heart was not perfect with the LORD his God, as was the heart of David his father.5 For Solomon went after Ashtoreth the goddess of the Zidonians, and after Milcom the abomination of the Ammonites.6 And Solomon did evil in the sight of the LORD, and went not fully after the LORD, as did David his father.7 Then did Solomon build an high place for Chemosh, the abomination of Moab, in the hill that is before Jerusalem, and for Molech, the abomination of the children of Ammon.8 And likewise did he for all his strange wives, which burnt incense and sacrificed unto their gods.9 And the LORD was angry with Solomon, because his heart was turned from the LORD God of Israel, which had appeared unto him twice,10 And had commanded him concerning this thing, that he should not go after other gods: but he kept not that which the LORD commanded.11 Wherefore the LORD said unto Solomon, Forasmuch as this is done of thee, and thou hast not kept my covenant and my statutes, which I have commanded thee, I will surely rend the kingdom from thee, and will give it to thy servant.12 Notwithstanding in thy days I will not do it for David thy father’s sake: but I will rend it out of the hand of thy son.13 Howbeit I will not rend away all the kingdom; but will give one tribe to thy son for David my servant’s sake, and for Jerusalem’s sake which I have chosen. a. Solomon loved many foreign women: There are two obvious problems here. First, that he loved foreign women who worshipped other gods and brought pagan influences to Israel. Second, that he loved many women, rejecting God’s plan from the beginning for one man and one woman to become one flesh in marriage (Matthew 19:4-6, Genesis 2:23-24). b. Nations of whom the Lord had said to the children of Israel, “You shall not intermarry with them”: God gave a general warning to all Israel to not intermarry with these nations, because surely they will turn away your hearts after their gods. For all Solomon’s great wisdom, he did not have the wisdom to apply also this simple command to his own life. Jeremiah 44:23 Because ye have burned incense, and because ye have sinned against the LORD, and have not obeyed the voice of the LORD, nor walked in his law, nor in his statutes, nor in his testimonies; therefore this evil is happened unto you, as at this day. Year 2083 (2147 BC) – Call of Abraham. Israel is chosen by God to witness to the world. of in the Past, and in Spain, it was by Royal Decree. THE JEWISH TEMPLE UNDER KING DAVID AND KING SOLOMON WAS A GLORY IN ITS TIME. TWO TERRIBLE DESTRUCTIONS IN 586 B.C. 70 A.D HAVE LEFT THE TEMPLE MOUNT WHAT IT IS TODAY, AN EMPTY DESOLATION. 1 Corinthians 10: 9 Nor let us try the Lord, as some of them did, and were destroyed by the serpents. 10 Nor grumble, as some of them did, and were destroyed by the destroyer. 11 Now these things happened to them as an example, and they were written for our instruction, upon whom the ends of the ages have come. Numbers 14:37 these men who were responsible for spreading the bad report about the land were struck down and died of a plague before the LORD. Deuteronomy 1:26 But you were unwilling to go up; you rebelled against the command of the LORD your God. Numbers 16:49 But 14,700 people died from the plague, in addition to those who had died because of Korah. Psalms 78:40 How often they rebelled against Him in the wilderness And grieved Him in the desert! Psalms 78:8 And not be like their fathers, A stubborn and rebellious generation, A generation that did not prepare its heart And whose spirit was not faithful to God. Deuteronomy 31:27 “For I know your rebellion and your stubbornness; behold, while I am still alive with you today, you have been rebellious against the LORD; how much more, then, after my death? Psalms 107:11 Because they had rebelled against the words of God And spurned the counsel of the Most High. Isaiah 48:8 “You have not heard, you have not known Even from long ago your ear has not been open, Because I knew that you would deal very treacherously; And you have been called a rebel from birth. Jesus’ proclaimed , “I am the way, and the truth, and the life. No one comes to the Father except through me” (John 14:6). Most importantly, the true leaders of the church are called by God to their office. False teachers, on the other hand, are “wolves in sheep’s clothing” (Matthew 7:15; cf. Acts 20:29) who choose the fate of Korah over the life of Christ. The Bible starts in Genesis but the Genesis location was not in Israel as Israel was not formed until 1209 BCE. The Exodus, “the going out” (from Egypt), was regarded by all of the Israelites themselves as the beginning of their national history. As per the New Testament itself, Ten of the letters which bear Paul’s name belong to the period before the end of his Roman imprisonment were written in Rome and not in Israel. These ten, in order of writing, may be dated as follows: Galatians, 48; I and 2 Thessalonians, 50; Philippians, 54; I and 2 Corinthians, 54-56; Romans, 57; Colossians, Philemon, and Ephesians, c. 60. The Pastoral Epistles, in their diction and historical atmosphere, contain signs of later date than the other Pauline Epistles, but this presents less difficulty to those who believe in a second imprisonment of Paul at Rome about the year 64, which was ended by his execution.’ The Pastoral Epistle can then be dated c. 63-64, and the changed state of affairs in the Pauline churches to which they bear witness will have been due in part to the opportunity which Paul’s earlier Roman imprisonment afforded to his opponents m these churches. The Book of Revelation itself was not written in Israel but on the Island of Patmos. Revelation 1:9 I John, who also am your brother, and companion in tribulation, and in the kingdom and patience of Jesus Christ, was in the isle that is called Patmos, for the word of God, and for the testimony of Jesus Christ. 4 and Judas Iscariot, who also betrayed him. “When morning came, he called HIS DISCIPLES to him and chose twelve of them whom he also designated apostles: Simon (whom he named Peter), his brother Andrew, James, John, Philip, Bartholomew, Matthew, Thomas, James son of Alphaeus, Simon who was called the Zealot, Judas son of James, and Judas Iscariot, who became a traitor” (Lk. 6:13-16) (ibid.). God punished Israel for their sins, rebellions by taking the land of Israel from them even three times now.. Spain is one of 92 Countries in Europe they the Jews have been Kicked out of in the Past, and in Spain, it was by Royal Decree. Fact #1. Who has the right to decide to whom any Land belongs to ? The biblical answer to that question is that God, Jesus Christ alone determines all of the “rights” that any of us have. The existence of God previous to the creation of the universe and mankind gives Him the right to determine our “rights.” “The Earth is the Lord’s and all it contains, the world and those who dwell in it” (Psalm 24:1). The New Testament does not teach that the Gentiles have superseded the Jews; but neither does it teach a racial exclusivity that gives Jewish people preferential or an elevated status. According to Paul, God’s intention has always been to break down the “wall of partition” and create for Himself one new people, drawn from every race (Eph. 2:11–16).The new people chosen are called solely Christians too. This is no New Testament verses that interprets the Abrahamic Covenant solely as being applicable to Jews in reality. Israel’s sin and subsequent exile from the Land did change their divine right to this Land given to them in the past by the Lord. The Jewish people were once the Chosen People but they no longer are the Chosen people, Christians are, It is significant that in the New Testament the term chosen is never used exclusively of the Jewish people. It is used only to refer to Jesus or the church, the body of Christ (e.g., Col. 3:12). “And his feet shall stand in that day upon the mount of Olives, which is before Jerusalem on the east, and the mount of Olives shall cleave in the midst thereof toward the east and toward the west, and there shall be a very great valley; and half of the mountain shall remove toward the north, and half of it toward the south” (Zech. 14:4). “The glory of Lebanon shall come unto thee, the fir tree, the pine tree, and the box together, to beautify the place of my sanctuary; and I will make the place of my feet glorious (Isa. 60:13). This unusual passage of Scripture is an accurate usage of Jewish law, for we read in Deuteronomy 25:7, 10: “And if the man like not to take his brother’s wife, then let his brother’s wife go up to the gate unto the elders, and say, My husband’s brother refuseth to raise up unto his brother a name in Israel, he will not perform the duty of my husband’s brother. . . . Then shall his brother’s wife come unto him in the presence of the elders, and loose his shoe from off his foot, and spit in his face, and shall answer and say, So shall it be done unto that man that will not build up his brother’s house. And his name shall be called in Israel, The house of him that hath his shoe loosed” (Deut. 25:7, 9, 10). Now I commit you to God and to the word of his grace, which can build you up and give you an inheritance among all those who are sanctified” (Acts 20:32). Jews still will always be far from any right to the promise land because of all their own unrepentant SINS, ACTS, even the blood shed of many others that they have killed from generations to generation even the shed blood of Jesus. (Mat 23:38 KJV) Behold, your house is left unto you desolate. 39 For I say unto you, Ye shall not see me henceforth, till ye shall say, Blessed is he that cometh in the name of the Lord. The Jews alone have by their return to Israel have usurped the authority of the Lord God of Hosts Himself, who alone has the right to give and take away the land of Israel as so far there is no New testament word confirming any of it’s return.. …the Land belongs now to Jesus Christ alone and his bride the Church… it is all his, he had undeniably bought it with his life and redeemed it alone! In Genesis 12 and 15, God promises to give Abraham’s family a place to live and indicates the extent of that place: “To your descendants I give this land, from the river of Egypt to the great river, the Euphrates” (Gen. 15:18). In Genesis 17, God repeats and amplifies the promise: “I will make nations of you, and kings will come from you. I will establish my covenant as an everlasting covenant between me and you and your descendants after you for the generations to come, to be your God and the God of your descendants after you. The whole land of Canaan, where you are now an alien, I will give as an everlasting possession to you and your descendants after you; and I will be their God” (Gen. 17:6–8). Contrary to dispensationalists, Jews, Messianic Jews who understand the promises God made to Abraham concerning the land as eternal, Christians see the promises not as an end in themselves, but as a foretaste of heaven. The New Testament authors insist that through faith in Christ we already inhabit the heavenly Jerusalem and look forward to its appearing (Heb. 12:22–23). Paul, similarly, insists, “But the Jerusalem that is above is free” (Gal. 4:26). The “Jerusalem above,” the heavenly city for which the Old Testament patriarchs reportedly were longing, therefore, is not the territory from Egypt to Iraq, but a relationship with the living God. In this context, residency in Canaan was only ever intended to be a prelude. The writer of the book of Joshua, for example, makes clear that the covenant promise already had been fulfilled by his generation (Josh. 21:43–45). Nehemiah, writing after the second exile, likewise looked back and testified to the fulfillment of the promises made to Abraham: “You gave them kingdoms and nations, allotting to them even the remotest frontiers.…You made their sons as numerous as the stars in the sky, and you brought them into the land that you told their fathers to enter and possess” (Neh. 9:22–23). A person has to have a terrible bias in assuming that the Jewish people the perpetual right to the Land of Israel The Promised Land was never an unconditional right, but always a conditional gift. During the wilderness wanderings, God warned His people, “If you defile the land, it will vomit you out as it vomited out the nations that were before you” (Lev. 18:28).“‘This is what the Sovereign LORD says: Since you…shed blood, should you then possess the land? You rely on your sword, you do detestable things…Should you then possess the land?…I will make the land a desolate waste, and her proud strength will come to an end” (Ezek. 33:25–29; see also Jer. 17:4). Micah 5—the same passage which said the Messiah would be born in Bethlehem—also said that in that day God would destroy Israel’s horses and demolish its chariots. Israel’s military implements are mentioned in the same breath as other signs of their apostasy: witchcraft, idols, sacred stones, Asherah poles. The prophets considered militarization a form of idolatry—a blatant violation of Israel’s covenant with God. “Do not defile yourselves in any of these ways, because this is how the nations that I am going to drive out before you became defiled. Even the land was defiled; so I punished it for its sin, and the land vomited out its inhabitants. But you must keep my decrees and my laws… And if you defile the land, it will vomit you out as it vomited out the nations that were before you” (Lev. 18:24-28). If the Israelites’ claim to the land was conditioned on obedience, and if they were deported from the land in the first century because of the ultimate disobedience of rejecting their Messiah, how can it be affirmed that they now have a right to the land when they persist in the same disbelief and rejection of their Messiah? “Produce fruit in keeping with repentance. And do not begin to say to yourselves, ‘We have Abraham as our father.’ For I tell you that out of these stones God can raise up children for Abraham. The axe is already at the root of the trees, and every tree that does not produce good fruit will be cut down and thrown into the fire” (Luke 3:8–9). Israel was an occupied Roman territory in the first century. When the Romans lead by Titus’ army in 70 AD destroyed Jerusalem and her temple, it resulted in Israel being taken captive in their own country. The survivors left in the land went into slavery while others were dispersed according to the promise of Moses (Deut.30). Jesus had foretold this 70 AD event in Luke’s gospel. The rights of Israel and the promises made to Abraham were given in the context of a covenant relationship that was intended to bless all peoples of the world. To insist, therefore, on an interpretation of those promises that now gives solei people of Jewish origin born in other parts of the world an exclusive title deed to much of the Middle East in perpetuity, at the expense of the is clearly contrary to their Old Testament context even as to their New Testament fulfillment. “By calling this covenant ‘new,’ he has made the first one obsolete; and what is obsolete and aging will soon disappear” (Heb. 8:13). “Believe me, woman, a time is coming when you will worship the Father neither on this mountain nor in Jerusalem…a time is coming and has now come when the true worshipers will worship the Father in spirit and truth, for they are the kind of worshipers the Father seeks” (John 4:21–23). “My kingdom is not of this world. If it were, my servants would fight to prevent my arrest by the Jews. But now my kingdom is from another place” (John 18:36). Zionists falsely assume that the Old and New Testaments run parallel into the future, the former speaking of Israel and the latter speaking of the church; however, this is not the way the New Testament interprets, fulfills, and completes the Old. For example, Jesus annulled the Levitical food laws when He said, “Don’t you see that nothing that enters a man from the outside can make him ‘unclean’? For it doesn’t go into his heart but into his stomach, and then out of his body. (In saying this, Jesus declared all foods clean. )” (Mark 7:18–19). The writer to the Hebrews, then, declares, “By calling this covenant ‘new,’ he has made the first one obsolete; and what is obsolete and aging will soon disappear” (Heb. 8:13). He insists later, “The law is only a shadow of the good things that are coming—not the realities themselves. For this reason it can never, by the same sacrifices repeated endlessly year after year, make perfect those who draw near to worship” (Heb. 10:1).It is essential that all Christians interpret the Old Testament in the light of the New Testament, and not the other way around. Jerusalem has seen two temples built on the Temple Mount. The first was built by King Solomon close to 3,000 years ago. It was destroyed by the armies of Nebuchadnezzar in 586 B.C. The second temple was built under Zerubbabel during the years 520-516 B.C. This was destroyed in 70 A.D. Since the destruction of the Temple in 70 A.D. there has been a desire among many observant Jews to rebuild the Jewish Temple. The rebuilding of the temple is not sanctioned by God. Jesus, the Holy Spirit nor promised directly as such too.. there is no need for a third temple as Jesus is the temple now. John 8: 23 And he said unto them, Ye are from beneath; I am from above: ye are of this world; I am not of this world. You are a Messianic Jew? But there really is no such thing in the whole New testament.. all the Jews became Christians. The false need of the Jewish Christian to keep their Jewish identity is a direct result, proof that they have not given up all to Jesus, as Jesus Christ is not the sole lord of their life still. And just as many people convert to Judaism, and become Jews, those who convert out of Judaism are no longer Jews. The problem with Messianic Jews is..(1 Tim 1:7 KJV) Desiring to be teachers of the law; understanding neither what they say, nor whereof they affirm. “Premillennialism is the notion that Jesus will return to this earth before he commences a one thousand-year reign on David’s throne in Jerusalem. Premillennialism, and its theological sister, dispensationalism, are quite erroneous in that they repudiates numerous fundamental Bible truths. Further, it is exceedingly dangerous in that it offers a false hope to Jews. This “hope” has been grossly misplaced. “It is still false to suggest that God had intended to perpetually favor one nation over all others. Such a notion is at variance with the multiple Bible affirmations which assert the universal love of God, and his just, impartial disposition with reference to the whole human family (cf. Genesis 12:3; Psalm 145:9; Acts 10:34-35). God’s initial selection of the Hebrew people, and the acquisition of the land of Canaan, was preparatory to the coming Christ. Jehovah employed the Jewish nation as a medium for the introduction of Christ into the world. Now that the Messianic mission has been accomplished, the role of “national Israel” no longer exists (cf. Galatians 3:24-25). That “middle wall of partition,” designed to isolate Israel from the nations, has been broken down (Ephesians 2:14). It was abrogated at the cross (Colossians 2:14). From the divine viewpoint, old physical Israel has passed away. It has been superseded by a new Israel. The genealogy of Luke 3 makes it quite clear that Jesus is the true Son of Adam, and this accords with the use of the title “Son of Adam” in the Gospels. Jesus is the “beloved Son” with whom God is pleased (Luke 3:22). Indeed, Luke follows this baptismal declaration with his genealogy showing that through Adam, Jesus is the Son of God. Jesus is looked upon as both the ideal Adam and the ideal Israel—that is, He is the people of God, the Seed of Abraham to whom all promises were made (see Gal. 3:16). Jesus as the Son of Adam (Son of man) accomplishes that which Adam failed to do; and likewise, as the true Israel, He does what Israel failed to do. Thus the temptation narratives show the reversal of Satan’s conquest of Adam in the garden and of Israel in the wilderness. If Jesus is the true people of God, the true Adam and the true Israel, all the prophecies concerning the restoration of Israel to be the people of God must have their fulfillment in Him. So Paul, preaching the gospel of Christ, was addressing himself to the hope of Israel (Acts 26:6, 7; 28:20). The consistent testimony of the apostle is to Christ as fulfiller (see 2 Cor. 1:20). We may not seek the true Israel outside of Christ or look for her restoration apart from the gospel. To become one of the people of God, one must be incorporated into Christ by faith (John 1:12; 2 Cor. 5:17; etc.). Israel’s hope was to return to Zion, the place of God’s dwelling among His people. The New Testament must tell us where Zion is if we would discover the new temple and the ruling son of David. Because Jesus is the Son of David to whom rule is given, Zion is where He is—i.e., in heaven. The kingdom of God cannot be separated from the presence of Jesus (Heb. 12:22). As far as the New Testament is concerned, Old Testament prophecy about the rule of God and the temple is fulfilled in the gospel. The resurrection of Jesus is not only the restoration of the temple (John 2:19-22), but also the re-enthronement of the Davidic king (Acts 2:30, 31). The true temple is in heaven, where Jesus reigns now (Acts 2:33, 36; Heb. 8:1, 2). While believers are separated from their Lord (they are on earth, He is in heaven), there is another temple created by the Holy Spirit, who unites believers with the ascended Lord (2 Cor. 6:16; Eph. 2:11-22; 1 Peter 2:4-8). The New Testament develops Stephen’s assertion that God’s temple is not made with hands (Acts 7:47-50). It is, in fact, the heavenly dwelling to which temple prophecy ultimately points, and there the Eden typology is answered in the face-to-face relationship which requires no symbolic temple, for God is the temple (Rev. 21:22). All the biblical promises find their fulfillment in Jesus Christ. Every element of the Old Testament’s unfolding revelation of the kingdom leads to the Person of Jesus Christ come in the flesh. The kingdom of God has its objective reality in Him. He is God’s true people. His presence marks the presence of God in the place we designate His kingdom. His word comes as God’s ruling word with all authority. The New Testament, in declaring the kingdom “at hand” with the coming of Jesus. Jesus did not come to destroy the hopes of the Old Testament, but to fulfill them. The stage is fully set in the Old Testament. In the fullness of time Jesus breaks in upon that stage “preaching the gospel of the kingdom of God, and saying, The time is fulfilled, and the kingdom of God has arrived and is here] : repent ye, and believe the gospel.” Mark 1:14,15. The long-looked-for, hoped-for kingdom of God has arrived in the Person and work of Jesus Christ. The hope of Israel has become present fact in Jesus Christ. In His Person and work the new age has broken in upon human history. The miracles of Jesus were not just a case of His proving that He was the true Messiah—for the false Christ is the one who ostentatiously shows himself off as Christ by signs and wonders (2 Thess. 2:1-9; Matt. 24:24)—but the miracles of Christ are the incontestable evidence that the powers of the new age have broken into history. Here is the Son of man, the new Adam, the Man as man was meant to be, who is subject to God and therefore Himself is Lord of the whole created order. Whether it is an unbroken donkey, the sea and the waves, disease or demons, even death itself, all are subject to this Man who fulfills God’s plan of being Lord over God’s creation (Gen. 1:26-28). The marvelous works of Jesus are thus the manifestation that the kingdom of God has come among men (Luke 17:21). The Old Testament with all its hopes and promises finds its fulfillment in Jesus Christ. Paul declares that all the promises of God have found their fulfillment in Jesus Christ (2 Cor. 1:20). It is so typical unChristian even by the Messianic Jews to falsely condemn all Christians for being non Jewish, Gentiles, dogs, and to blame the Christians for all the Jewish hardships, persecutions, because most Jews still cannot, do not want to admit their own sins, personal negative acts contributions. In the New Testament the emphasis is now undeniably solely on the heavenly Jerusalem not the past, present one. About the future Prophecies about Israel to the Jews, Dispensationalists there are the upbeat prophecies but in Reality most, or almost all are dismal. That is the Biblical Jewish history, an ongoing testimony to just how bad it was and can become for the Jewish people, in the Diaspora and in Israel, “There is now the reality on the ground, becoming increasingly frightening by the day. Luke 17:3 Be on your guard! If your brother sins, rebuke him; and if he repents, forgive him. Note this reality 50 percent of all the loudly professing Christians I knew the last 50 years next made a free will choice to permanently abandon Jesus for the world, the flesh, and also 70 percent of the people going to church they still are not real Christians too. All persons who try to serve God in the flesh and are not Holy Spirit filled, lead so they will next go into both gross errors and also into guilt and depression. As Jesus Christ is still our only salvation and our righteousness. This entry was posted in Christian, Christian Life, Christianity, Relgious Christianaty and tagged Bible, Christian, Christianity, church, Deacons, Elders, faith, God, Holy Spirit, Jesus, Jesus Christ, Judaism, Life, pastors, religion, truth. Bookmark the permalink. Pingback: What does it really mean to follow Jesus Christ? | Missing the point? Reblogged this on 1st Wittness.